Expert Galleries are typically used to connect faculty with media opportunities, grant funders, research collaborators, and students to mentor. They also make it easy to highlight the faculty of a given department; award winners; grant-funded project participants; or other criteria you require. 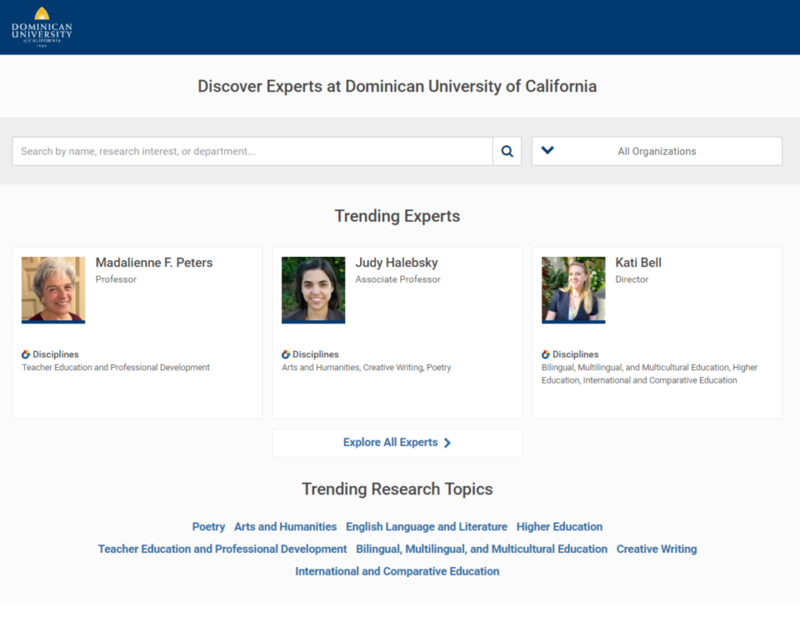 Using the “Explore All Experts” link, visitors can browse according to additional facet types including Discipline, Research Interest, Organization, and Position. 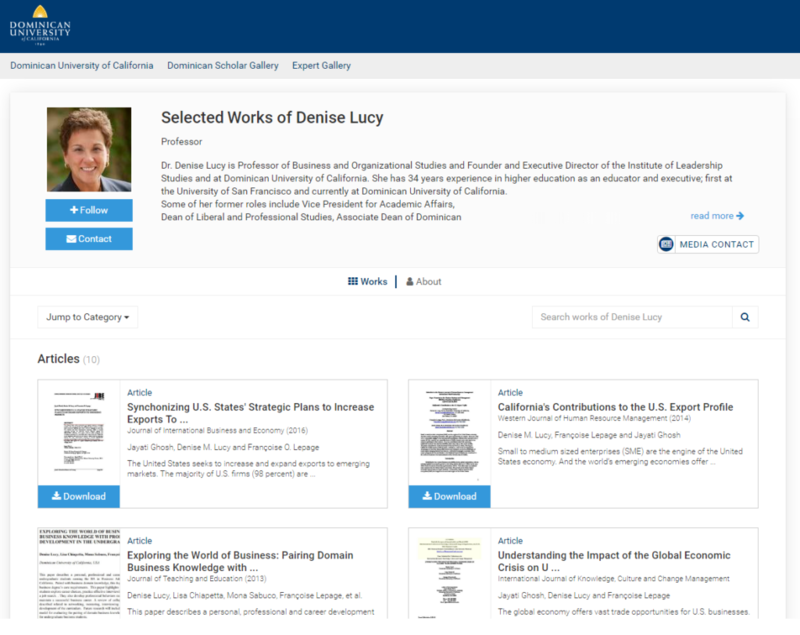 Each card leads to an expert’s SelectedWorks profile which presents works by or about the individual; contact information; research interests; and more. To learn more about building profiles, see our video tutorial, or take a quick tour of an Expert Gallery! Expert Galleries automatically match the institutional branding of your SelectedWorks profiles. This branding is set up via the Settings tab of the Administrative Interface. The selection of profiles is controlled by the Profiles tab. To learn more about the Settings and Profiles tabs, see our SelectedWorks Administrator Guide. For the steps of the setup process, see Getting Started with the Expert Gallery Suite. The exact URL of your institution’s Expert Gallery is configured by your consultant. It is typically https://works.bepress.com/experts/your-institution-name, and your consultant can modify the label (i.e., your-institution-name) if your institution changes its name or prefers an abbreviation. 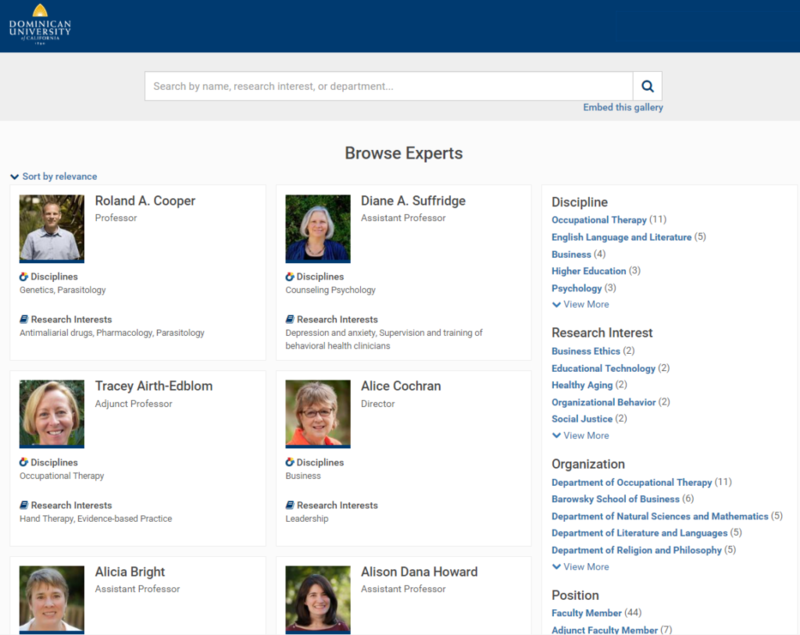 Unless configured otherwise, you may access your institution’s Expert Gallery via the navigation bar of any SelectedWorks profile affiliated with your institution. Want to embed your gallery on a page of the university website? It’s just cut and paste! 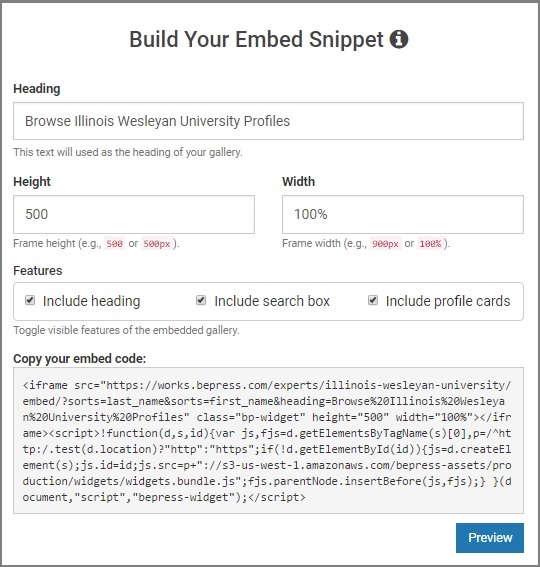 From the Browse page of your Expert Gallery, click the “embed this gallery” link to receive a snippet of code that you can copy and paste into the code of the external webpage. Want fewer profiles? Administrators may select profiles from their institutional gallery to create additional galleries, showcasing selected authors. Showcase just the faculty of a given unit on a department’s webpage. 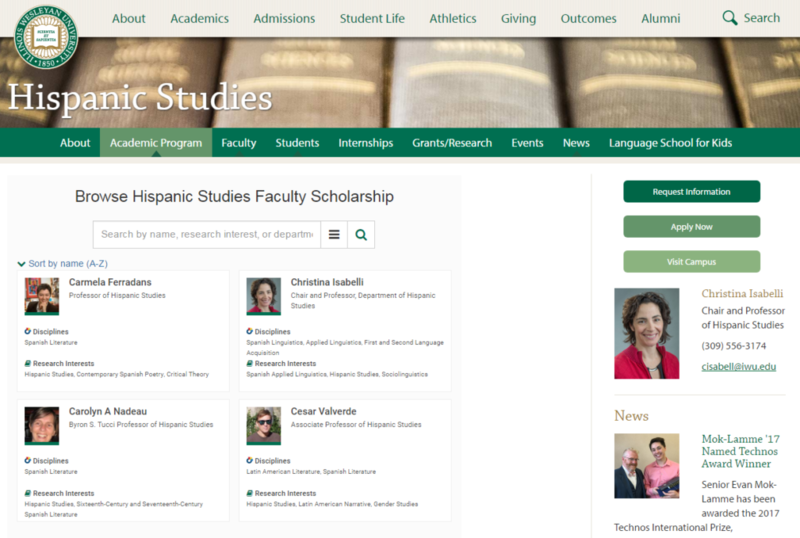 Present a selection of grant recipients on the Office of Research webpage. To learn more, see “Creating and Embedding Additional Galleries to Showcase Authors” below. Note: the “embed this gallery” link is suppressed from mobile devices, streamlining the display and user experience. Each facet is followed by a number to indicate the number of matching profiles. Facets and facet types will not appear unless there is at least one matching profile. Use the facets to narrow your selection of profiles, and then click on a profile’s card to see the author’s Works and About tab for more information. The results per facet correspond with the information entered on an individual’s About tab. For best results, have the profile owner complete the About tab and update it periodically, or provide you with suggested changes at the start of the year. By default, your institution has an Expert Gallery that includes profiles from across the institution. If your institution also has Digital Commons, it has a SelectedWorks Author Gallery automatically embedded into your repository. In this section we explore some of the additional options for galleries, built using the the Expert Gallery Suite. Using the membership badges for Media Contacts, Collaborators, and Mentors, you have three additional galleries that visitors can use to easily spot potential connections at your institution. To access the galleries, click on a profile’s badge to see all members of this group. To embed the gallery on an external website, click “embed this gallery”, modify the pre-formatted code and preview if desired, and then cut/paste the code into the desired site. To learn more about membership badges, see Managing Memberships and Contact Buttons. Facets like organization, position, discipline, and research interest can be used to create additional galleries. To access the galleries, go to the Browse page of your Expert Gallery, and use the facets to narrow your view to the desired profiles. To embed the gallery on an external website, click “embed this gallery”, modify the pre-formatted code and preview if desired, and then cut/paste the code into the desired site. Any search performed within your expert gallery can become an embeddable gallery. Simply click the “embed this gallery” link to generate embed code for your search results. For assistance with targeting specific profiles or embedding an expert gallery, please contact your consultant.